"How Did This Health Professional Own Multiple Successful Clinics, Only Visit Them For a Few Hours Each Week, and Consistently Bring Home More Money Than Those Working 60+ Hour Weeks?" If you're like most health professionals, you're so busy seeing clients and putting out daily fires you simply don't have enough time left at the end of the day to grow your practice. You may barely have enough time to spend with family and friends, let alone spend time "working on your business" like the expects constantly tell us. As you probably already know, you'll never get your life back or grow your practice the way you want until you create systems, scripts, and effective procedures for your staff to use. But how will you find the time...with everything else desperately needing your attention? It's a catch 22. You don't have enough time to manage your business. Yet you can't escape the daily grind until you take the time to create systems which FREE you from the daily responsibility. There hasn't been a solution...until now. What I'm offering you today is my fully systematized - step-by-step - program including ALL the tools, scripts, documents, and procedures you need to transform your health business today. Everything is already DONE FOR YOU in this program. You can take that time draining, labour intensive beast and transform it into a money machine that's consistently and efficiently earning you income day-by-day whether you're at the business or not. You'll have a health business that works without you...in 42 days or less...100% guaranteed. I thought I already had great systems in my businesses (which was how I was able to operate them from anywhere in the world) - but I discovered my systems where not being used correctly in my clinics. Some steps were not being done at all - reducing my business profits. To fix this problem I re-focused on the "12 Key Steps" and got to work targeting and fine tuning these steps over an intensive 6 week period across my 3 clinics. The results were incredible. They were so shocking I decided to make this unique program available to struggling health business owners like you – this truly is your "fast track to the ultimate health business lifestyle". "The Practice Acceleration Program – 12 Steps to a Great Health Business in ONLY 42 Days"
"I wish someone had given this program when I started my first health business – it would have saved me 20 years of trial and error, thousands of dollars in lost income and even more in wasted time that I could have spent with my family and friends"
What’s included in the "Practice Acceleration Program"? This unique program takes you inside Pauls clinics for an intensive 6 Week (42 day) intervention - where he personally trains, mentors and coaches the teams at his health clinics on his incredible "12 Step System" – which effectively increased his own clinic profits by more than 40% pre versus post program. 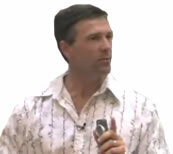 Paul has made available to you the exact same tools, templates, team meeting handout and scripts that he used in his own clinics to dramatically increase consult number, reduce cancellations and increase productivity – all of which can be immediately put into your health business for INSTANT PROFITS – Guaranteed. The "Practice Acceleration Program" takes you step by step through the exact same process that Paul used to increase his clinic profits by 40% whilst still only working on his clinics for one day a week. Each week of the 6 week program all you need to do is listen to one or two CDs – copy the handout provided – then have a 45 minute team meeting where you cover the exact same points that Paul did in his recorded team training sessions. It’s that easy. Paul has done all the work for you...almost no preparation, zero stress, and guaranteed results. I know the weekly meetings will take you and your team away from your clients for these meetings – however the cost will be repaid in a matter of weeks – if not days. Did you know the major reason health businesses lose team members is because they are not trained and mentored by their employer to become better therapists and more successful health professionals? Your team wants to be educated and exposed to new material and if you don’t provide this training they will simply resign and go to another employer who will help them improve. You should be having weekly team meeting anyway. The difference is these sessions will dramatically improve your clinic profits and improve your team morale. Imagine the impact of reducing cancellations by 30%, increasing call conversions at front desk by 50%, and having 90% of clients booking multiple sessions in advance? The cost for this program and the time it takes to implement it makes it an easy choice. This unique "Practice Acceleration Program" has been successfully implemented across Pauls practices by his Physiotherapists, Massage Therapists, Acupuncturists and Personal Trainers. In addition, the program has been implemented in other health businesses run by Osteopaths, Chiropractors, Doctors, Podiatrists and many more. It will work equally well in your health business – or we give you your money back – no problems and no risk to you. This program made an incredible difference in Pauls business – a business that already had great systems in place. Imagine what it could do for a business with limited systems, scripts and templates...especially with a more involved and present owner checking each step and monitoring the results. Admin staff say about the impact of the "Practice Acceleration Program"
Includes all team meeting handouts, documents, front desk scripts, templates, new patient paperwork, cancellation policies, 3 different action plans, spreadsheets, new patient registers, vouchers and other materials that Paul used in his clinics during this program. These documents and materials took Paul more than 20 years and over $40,000 in coaching, education and training to define and develop – and they are ready for you to put into your health business immediately. The data disc alone is worth more than the cost of the entire program. This is a truly unbelievable opportunity to fast track your business using the exact same systems that allow Paul to live where he wants and visit his clinics whenever he chooses. 17 Audio CDs / MP3’s – these are live recordings of Pauls team meetings and training sessions where he outlines and explains the "12 Step Program" – it also includes audio sessions of Paul explaining the program and how health professionals can truly develop a great business and a great life. CD / MP3 #1 - "Overview of the Practice Acceleration Program"
How YOU can turn just 2 hours a week for 6 weeks – into a 40% increase in profits. The "12 Steps" to success for health business owners that will double your consult number, reduce cancellations to almost zero, and generate instant referrals. The first "fly on the wall" session where Paul introduces the program to his team gains their support – and sets up the 6 week program – no more trial and error meetings – the handout is ready for you to follow NOW !!! Copy Pauls exact meeting and use the exact same handout – see how he gets his team on board and pumped up from Day One – don’t lose another cent due to slack or non-existent systems and scripts. No more wondering what to do in your business to increase profits and grow consult numbers – Paul has given you the steps and scripts to follow immediately. The biggest mistake Paul made in 20 years of business ownership and how he is going to fix it over this 6 week program – are you making the same mistake? This mistake alone has cost Paul more than $100,000 in lost profits over his business career. Your front desk team may be costing you thousands if you don’t have the right booking, phone, and cancellation scripts – these are all included in the handout for this admin team meeting. The 4 most important words your admin team MUST learn – and how not using these words is costing you thousands of dollars every month. Why the most successful health businesses in the world are lead generators –how to rake in the money with great lead generation ideas and materials. Conversion scripts and strategies to increase patient bookings – essential for all health professionals – tested and refined against multiple options over years. How to structure your initial examination to maximise rapport, gain the patients trust, happily book the number of treatment sessions recommended and buy any products you suggest. The one question that can determine the success or failure of your treatment plan and how to structure your paperwork so this question is NEVER missed. Follow up booking strategies that will keep your clients coming to see you when you choose – to ensure maximal program results and great client experience every time. Avoid the common mistake of failing to stay in touch – what to say and when to say it – the key to reducing cancellations and keeping your clients in track. How our university training led us to believe that we should not make a great income as a health professional – and the negative impact of this training on our patient results and bottom lines. Turn a 20 cent phone call into $200 in your pocket by using this follow up protocol - why are you not doing this NOW? How effective cross referral outperforms Yellow Pages by more than 5 times and how you are missing out on lost income by limiting your range of services. Fast track your junior team members to "legend status" in your clients eyes by using technology to bridge the therapist gap. The exact system Paul uses to maximise stock sales in his business that add thousands of dollars a month to his profits. Are you making the same mistakes in your stock sale program – assuming you even have a program in place. How to add hundreds of products to your online store – generate you passive income – even if you don’t have a full website. Cancellation scripts so tight that even your junior admin team can reduce lost appointments by more than 50%. The Program also includes 3 BONUS admin team training sessions recorded 4, 8 and 10 weeks post program. In these sessions Paul shows you how to fine tune your admin team, improve front desk conversion and reduce cancellations immediately. See how you can make your admin team a multi talented "sales team" looking for opportunities to make and save you money in every client interaction. How you can use these BONUS admin CDs to train your new admin members in 10% of the time it used to take – getting them confident and effective BEFORE they take their first call. These BONUS admin training CDs alone will pay for the entire program in a matter of weeks – guaranteed. In this final recording Paul will outline the next step and how to continue to grow your business so you can reduce your workload and free up time – just like Paul has done. Do you know the best resources and tools you can use to continue to improve your business and give you the ultimate health business lifestyle? Paul will share these resources with you in the "final session". 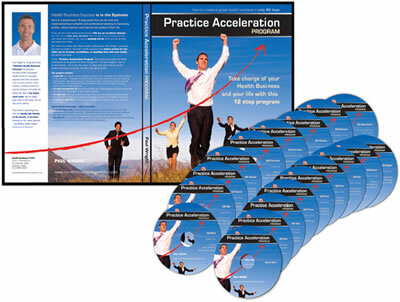 The Practice Acceleration Program (as with all of Pauls DVDs and Programs ) includes a 30 day - 100% money back guarantee . If you get the package and it doesn't immediately increase your bookings, earn you additional profits, and provide you with more time off – (highly unlikely) then simply send it back for a full refund – no risk to you. If you ever have any problem with it, simply contact our office...and we'll make it right. We're taking all the risk...something you likely have NEVER seen in a Done-For-You program such as this. Simply plug in the tools and watch the increased results from your team. If you're not satisfied for any reason, we'll give you all your money back. How Much Value is in this Program? Paul is often asked "Will you do one on one coaching for me in my health business?" His answer is always the same, "I only provide personal coaching to a very limited number of private clients – so join the queue and hope for the best". Paul values his time and freedom so highly he only works with a limited number of private coaching clients – so this is the closest many of you will ever get to being personally mentored by Paul. This Practice Acceleration Program represents better than a 90 to 1 return on investment. The value in this program is unbelievable – even if you are only charging $60-$70 for a standard session (I hope you are charging more than that). You only need to see an extra 15 or so client to pay for the full program. No wonder Paul is going to raise the price of the program shortly. Note – the prices above are our special webinar prices and are ONLY available to webinar viewers for a limited time post webinar. The usual Price is $1297 AUD (plus P and H) save $350 AUD by taking action NOW and taking advantage of this Special "Webinar Offer". If you place your order within 48 hours of viewing the webinar you qualify to request TWO DVD's from Pauls business building range. To select you preferred titles just write your two requested DVD titles in the "Special Delivery / Comments" box when you place your order. Save yourself thousands of dollars and countless hours by using Pauls current scripts, templates and protocols – tried and tested over the past 20 years – this program gives you the templates, scripts and materials to launch this program TODAY – remember "successful people spend money to save time" and this program will save you years of work and prevent countless mistakes. Reduce the impact of staff turnover – the systems and steps make your clinic a structured little money machine that does not rely on highly trained and expensive team members – Paul lost his most experienced therapist just after completing the program but simply gave the new (and much more inexperienced) replacement the PAP program to follow – and clinic numbers did not miss a beat. This unique program is specifically designed for health professionals by a fellow health professional who understands the struggles, problems, and stress that comes with health business ownership – use Pauls systems to claim back your life NOW!! You can benefit from Pauls 20 years of health business ownership experience and save yourself the pain and frustration that Paul went through to finally get to this stage of business success – would you like the freedom to choose when and where you go to work – and still have a great income? Share in Pauls knowledge gained from investing more than $40,000 in business coaching and over $20,000 in seminars, courses and training programs – including an Advanced Diploma in Business Management – don’t waste 20 years like Paul did – take the fast track and use his system. The PAP (like all of Pauls business building materials ) includes a 30 day - 100% money back guarantee – if you get the pack and don’t think it is for you – (highly unlikely) then simply send it back for a full refund – no risk to you. Paul has used this exact program in his already successful health businesses and increased his clinics profits by over 40% - with NO increased marketing costs or expenses – allowing him to again withdraw from the businesses to focus on his other interests – like water skiing and surf ski paddling. Using these systems will enable you to FREE yourself from your business - just like Paul did - to enjoy the freedom that all business owners should be feeling. Take advantage of Pauls optional easy payment plan – of 3 low monthly payments – allowing you to put these systems in place and increase your income BEFORE paying for the rest of the program. Beat the price rise – this program presents such great value there is little double that the current prices will not last long – Pauls business advisors are constantly at him to raise the price of this program – get in now before Paul takes their advice. Note - the special "Webinar Offer" is only available during the webinar period – after this period the price goes back up to the usual $1297 AUD price (this is also under review and likely to increase in the near future). The value in this program is unbelievable – even if you are only charging $60-$70 for a standard session (I hope you are charging more than that) – you will only need to see an extra 15 or so clients – to pay for the full program. We guarantee the ideas and materials in this program will get these extra consults in no time – this is a real no brainer for all health business owners. Who Will Benefit from the "Practice Acceleration Program"? This Program is for all health business and health professionals wanting to earn more, work less and enjoy life. The material is suited to current and future health business owners including Physiotherapists, Chiropractors, Osteopaths, Podiatrists, Personal Trainers, Massage Therapists, Acupuncturists, Doctors – in fact all health professionals wanting to earn a great living but also have a great life. The program is also set up to be used by smaller health business without full time administration support – as well as larger health businesses that utilize the services or full time or part time administration staff. If you are like most health professionals YOU are an excellent clinician – but YOU are so time poor and busy that you don’t have enough time for your family and friends. Life may be passing you by while you are at work and away from home. BUT there is a better way, health professional Paul Wright can show you how to create a "turn-key" health business that makes money for you while you're at home, on holidays, or spending time with your family...just as he has done. Paul Wright is living proof this "Ultimate Health Business Lifestyle" is possible. For more than 20 years he owned multiple successful Get Active Health clinics in Australia, but still spent more time at home than his wife preferred, never missed a school concert or sports carnival, and visited his clinics for only a few hours each week. At one time didn't even lives in the same city as 5 of his clinics! Having recently sold his clinics - for a great price - he now prefers spending time with his family and friends, at the beach, or at home working on his latest passions - The Practice Acceleration Program, Profit Club, Physio Professor and his popular One on One Coaching program for health professionals. Pauls "Practice Acceleration Program" - shows you exactly how he was able to operate his clinics remotely and still enjoy a great income - don't miss this incredible opportunity to live the life you deserve.